You radiator is what keeps your car from overheating, and is therefore one of the most important systems in your vehicle. If you have not had your radiator serviced in a while or you see signs that your car is heating too quickly, it is time to bring your car in for radiator repair at Federal Way Automotive & Radiator. 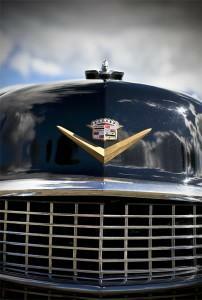 As coolant moves through your vehicle’s engine, air is blown over the coolant by a fan. The heat is then moved out of the engine and cooler liquid recirculates back through, carrying out more heat. The engine cooling system regulates the temperature of your engine, keeping it from overheating with radiator repair Federal Way. Leaking radiator fluid – If you see a greenish liquid under the spot where you park, you are leaking radiator fluid that needs to be repaired. Heating up too quickly – If you notice the heat gauge in your Federal Way vehicle shows your car is heating up more than normal, soon after you start your vehicle, then you may need radiator repair Federal Way. Overheating – If the gauge in your vehicle moves near or into the red zone, you need to get your car in right away. Steam under the hood – If steam is coming from under the hood, your car is likely overheating and needs to be brought in immediately for radiator repair Federal Way. 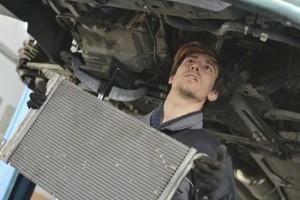 We offer a 22-point inspection of your cooling system. We conduct a thorough diagnosis on your entire radiator and cooling system to ensure the health of every aspect of that system. We recommend flushing your cooling system once a year. It is also advisable to get the full radiator inspection at that time. We offer certified, well-trained radiator technicians who gently care for your vehicle like it was our own. 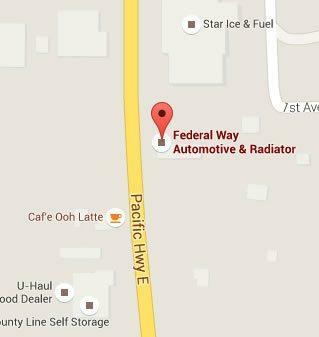 With nearly 30 years in the radiator repair Federal Way business, our knowledge and experience cannot be beat. We take time to answer your questions and go over the details of your radiator diagnostics with you. We stake our reputation on honest, reliable, quality service. Check out our A+ rating with the BBB and our many stars on various review sites. We care about fostering good relationships and offering top quality service you can count on.